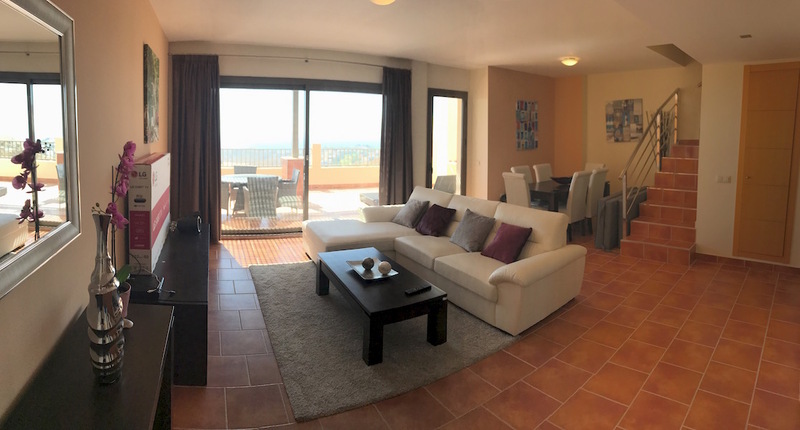 This stunning modern furnished 3 bedroom luxury La Cala Hill Club duplex penthouse for sale in the exclusive Los Cortijos, overlooking Calanova Golf in La Cala de Mijas, is the perfect place for a relaxing family holiday apartment, as a base for golfers or to live full time if you are looking to explore the many treasures of the Costa del Sol. 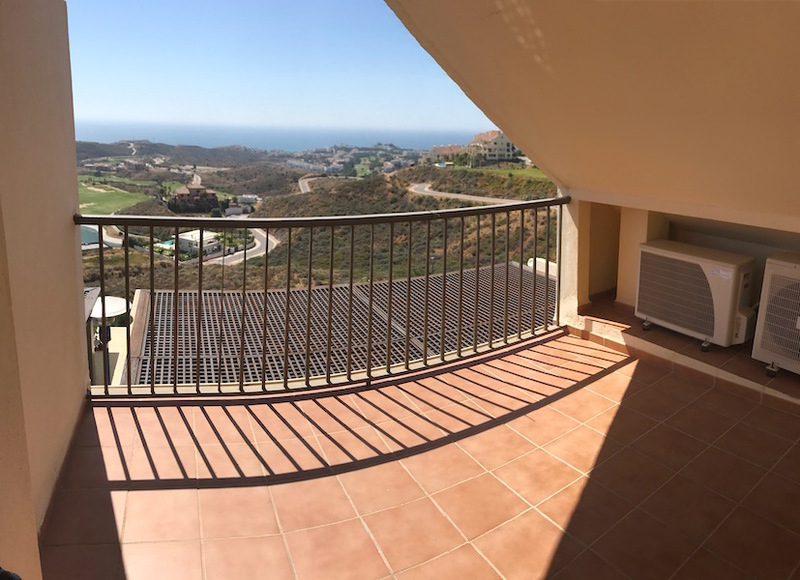 One of the best south facing bright 3 bedroom, 3 bathroom, penthouse apartments in La Cala Hill Club offering a sun-drenched and furnished, spacious 35m2 solarium terrace with stunning panoramic views and all day sunshine. The terrace also offers shade with a large pergola and a collapsible parasol. The lounge features a large chaise lounge sofa and dining area with 6 chairs. For your comfort there is a 49″ LG LED Smart TV with channels in English, Spanish, Flemish, German, French, Russian etc and 300mb maximum speed symmetrical unlimited Fibre Optic WiFi Internet. 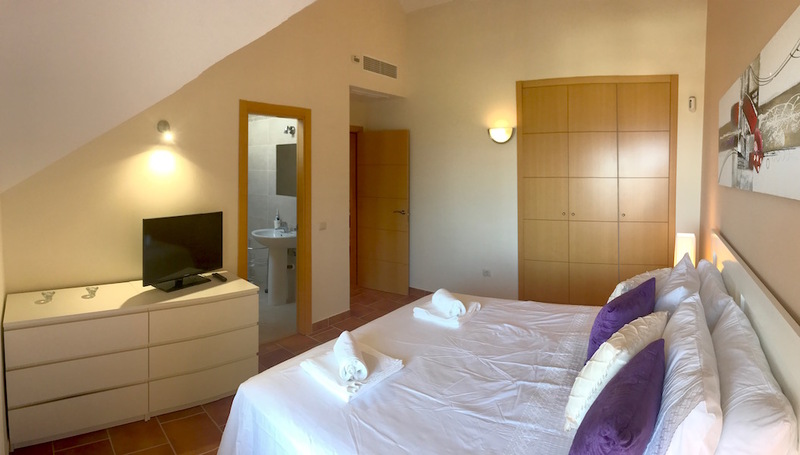 On the lower level there is also a large double bedroom, offering 2x 210cms long single beds and access to a full shower room, plus a fully equipped kitchen with laundry area. 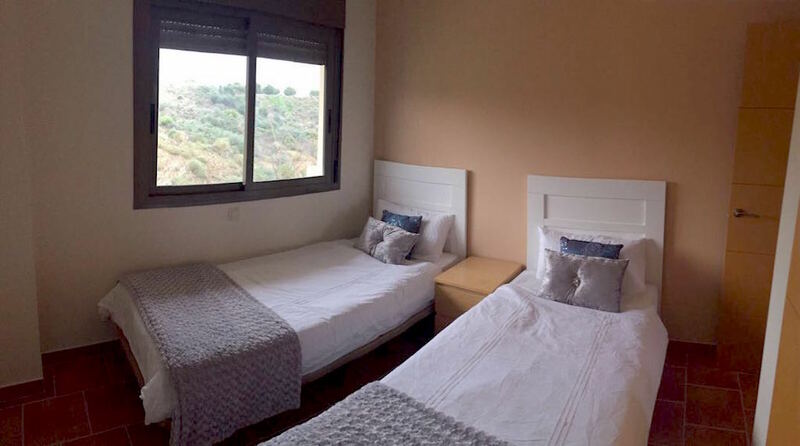 All the lower rooms are air conditioned hot and cold via a central split system unit. On the upper level you’ll find the spacious master bedroom with very high raised roof ceiling and master bathroom with full sized bath and shower. 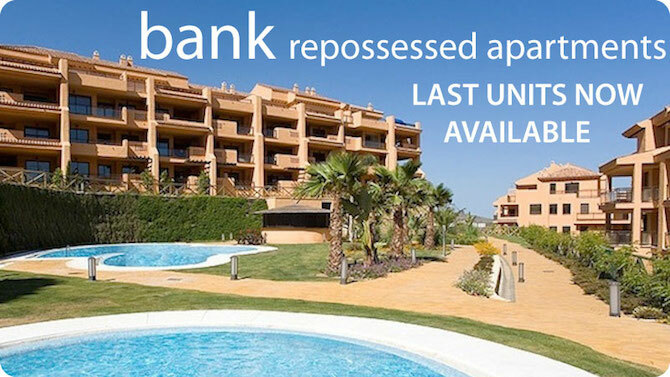 There is direct access to a private 10m2 covered terrace affording breathtaking views. The master bed is a brand new top of the range Pikolin Super King size 180cms x 200cms storage divan. 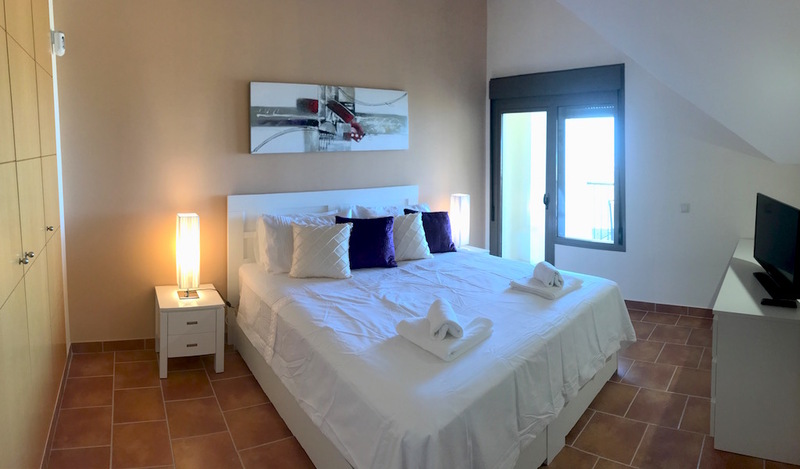 There is also a separate dedicated hot and cold air conditioning system and 32″ Samsung LED TV with the same selection of channels as downstairs. 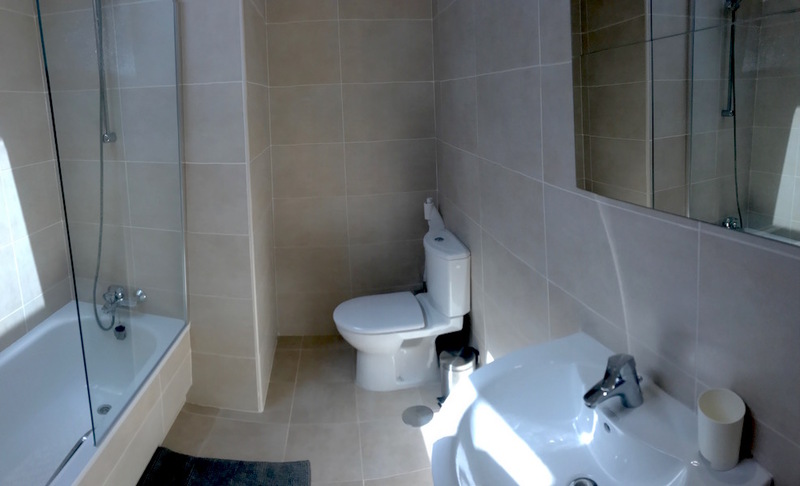 To the rear is the 3rd bedroom offering another 2x 210cms long single beds and a 3rd en-suite shower room. Owners have access to a selection of 3 swimming pools plus access to the new sun deck and jacuzzi area, 2x saunas and later there will also be a new on-site gymnasium and a spa area too (from Summer 2018). Calanova Golf clubhouse is close by, for all owners, golfers and guests, serving food and refreshments all day. BBQ night every Friday night during the summer months. The Costa del Sol boasts around 320 days of sunshine and is popular with holiday makers all year round due to the wonderful climate. It has a long summer period from June until October, when it is hot but pleasant with no humidity and no rain, ideal for beach holidays. During other seasons there is plenty of sunshine, so that you can enjoy lots of outdoor activities, such as golf and tennis. 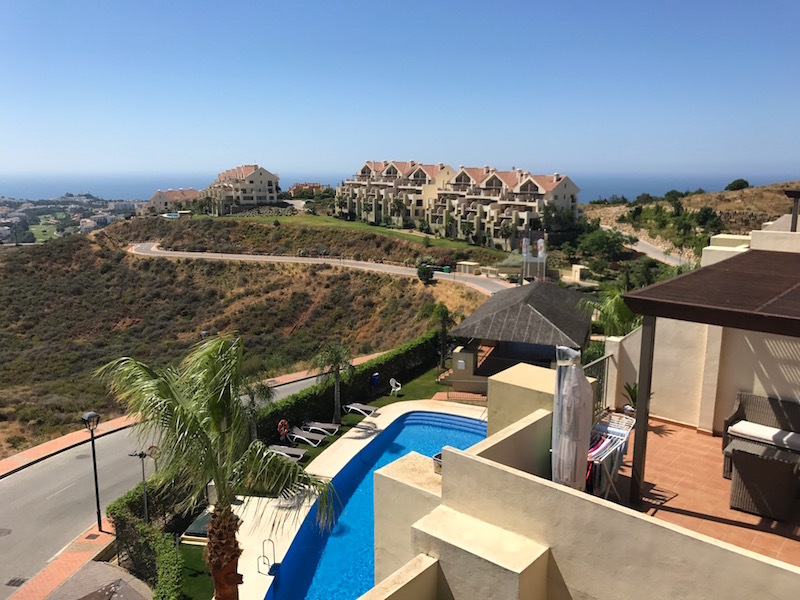 Mijas Costa is very popular with people from all walks of life, it has something for everyone, it is not difficult to see why people come back year after year. La Cala (the creek) is a charming former fishing village. It now plays host to a wide and varied range of eateries and bars. Why not dine on the beach front in one of the popular restaurants, like the new Olivia’s Champagne and Lobster Bar and restaurant, owned by Elliott Wright. There is a Supersol, LIDL, ALDI and a Mercadona (supermarkets) and plenty of banks / ATM’s. There is also a wide range of beauty salons, and a wonderful spa facility, this is the perfect place to unwind, and pamper yourselves. The beaches are long, sandy and well cared for, along with an upgraded beach walkway paseo and central beach square. There is a new wooden walkway running alongside the beach all the way as far as Cabopino. 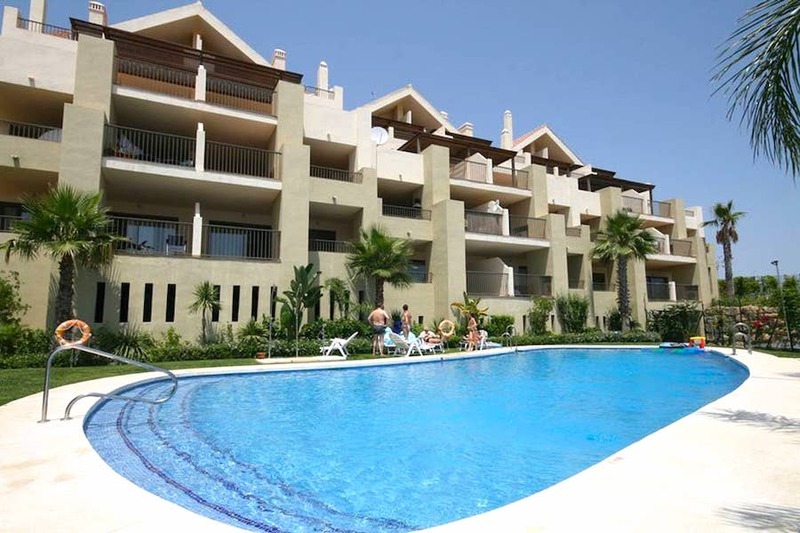 Fuengirola is a short drive away from the apartment, approximately 15 minutes. Here you will find shopping, bars and restaurants. There is also a Water Park and Zoo. Mijas Pueblo is a beautiful village, steeped in the hillside and well worth a visit. Here you will find horse & carriage rides, donkey rides, craft shops, restaurants and bars. Mijas Pueblo is a very popular visitor destination, and a short drive from the apartment. During the summer months it is recommended that guests spend an evening strolling through the cobbled streets, maybe even pop into one of the many restaurants for something to eat or drink. The restaurants are reasonably priced and the ambiance is lovely. Recommended. 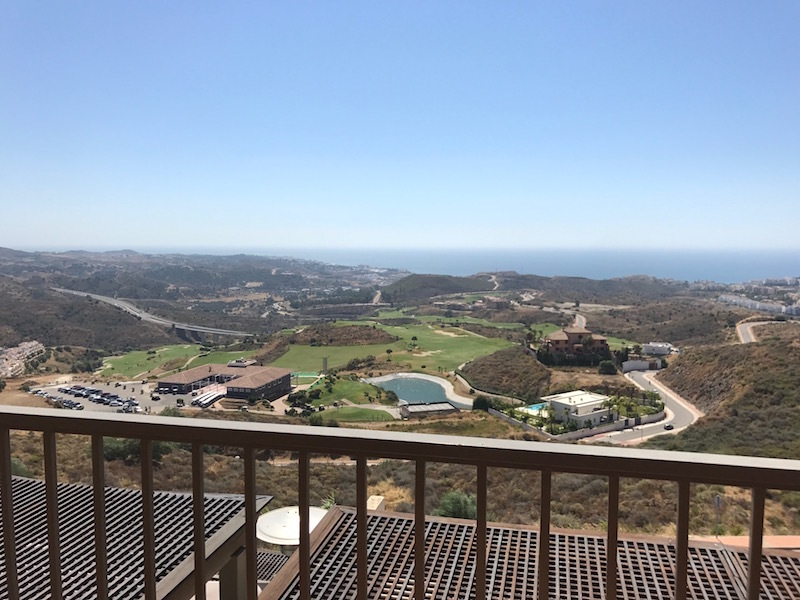 If you are looking for well-maintained golf courses you will find them here, the La Cala Golf course is one of the best in the area and certainly worth checking out, along with Calanova Golf, La Noria Golf, Miraflores Golf, El Chaparral and Mijas Golf. Calanova Golf has it’s brand new modern permanent clubhouse already inaugerated, complete with the Michael Campbell Academy, driving range and practice green, modern restaurant, gymnasium, spa and also the largest Pro Shop in Spain. There are plenty of recreational activities to choose from in the area. The Mijas Hipodrome can be easily found by driving into La Cala and following the simple directions. Benalmadena is a fairly short drive away, visit the pretty harbour where you can take boat trips as well as visit the famous Aquarium. There is also a telecabin chair lift for those of you wanting to take in the breathtaking views of the famous coastline from the Mijas mountain range. If you fancy something a bit different then why not take a day trip to Morocco these can be easily arranged through us. These trips are by fast ferry from Tarifa and are comfortable and the crossing only takes around 45 minutes to 1 hour. There is a direct regular new electric train link from Málaga to Fuengirola, which passes and stops at the Airport. 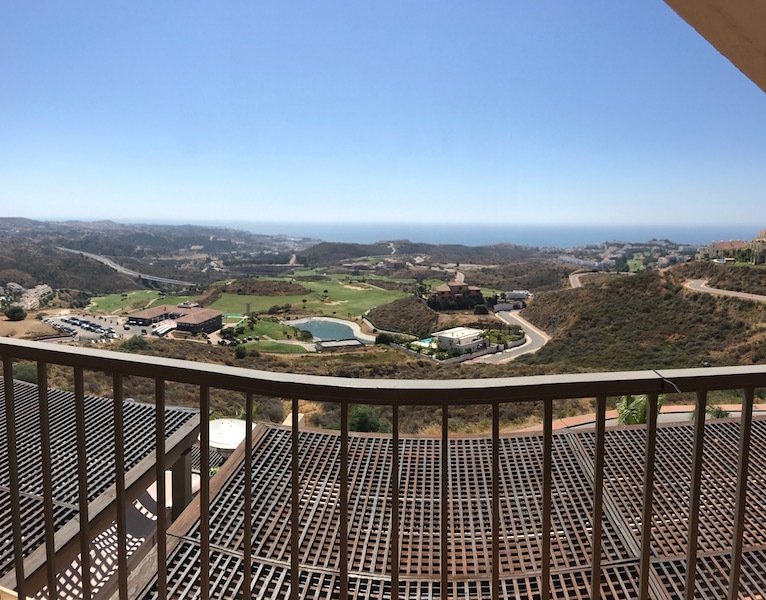 The regular 220 bus runs all day regularly between Fuengirola and Marbella, and the local stop is La Cala de Mijas, where you can grab a taxi up to the development. The fittest guests can walk if they really enjoy their fitness, but it’s not recommended. 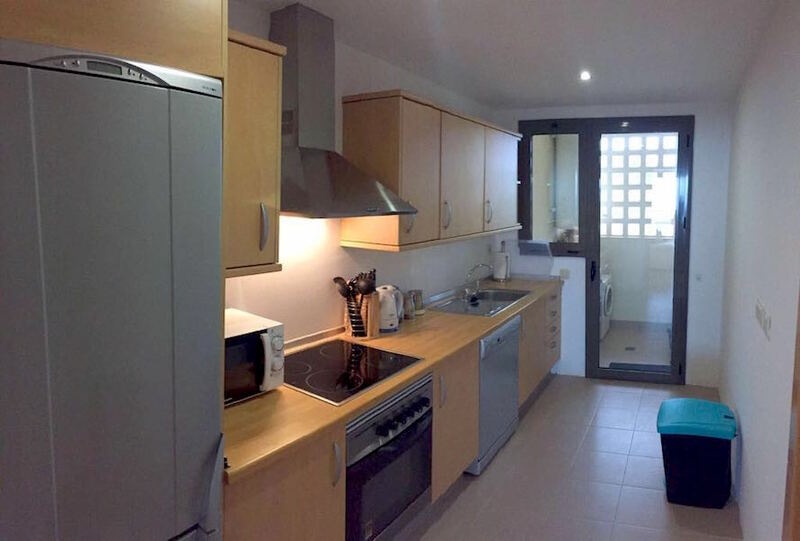 Please note that this apartment is in a fantastic location, although it is a good downhill 45 minute walk, in order to reach the local amenities. Of course it only takes less than 5 minutes by car to La Cala de Mijas. A car is strongly recommended for this property as it is located 4kms up the hill. 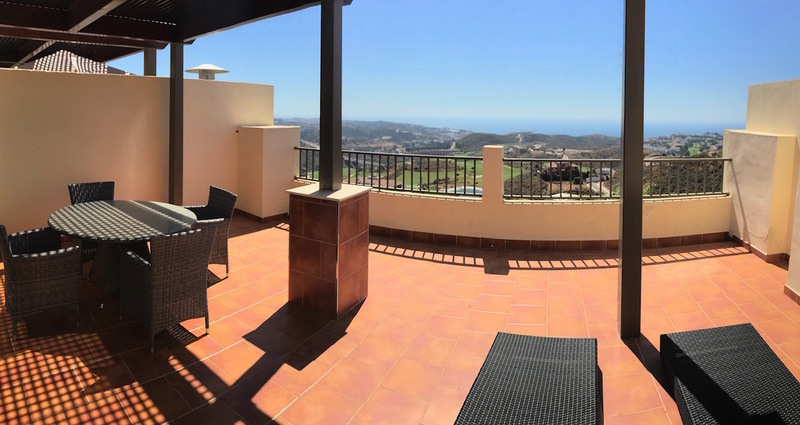 Great views of the Calanova golf course for golfers and only a short distance from the Calanova Golf clubhouse offering refreshments and snacks, plus BBQ’s every Friday and Happy Hour between 4.30pm to 6.30pm everyday in summer. This property is disabled friendly. There is a lift in the apartment building along with ramps in the communal areas providing wheelchair access. 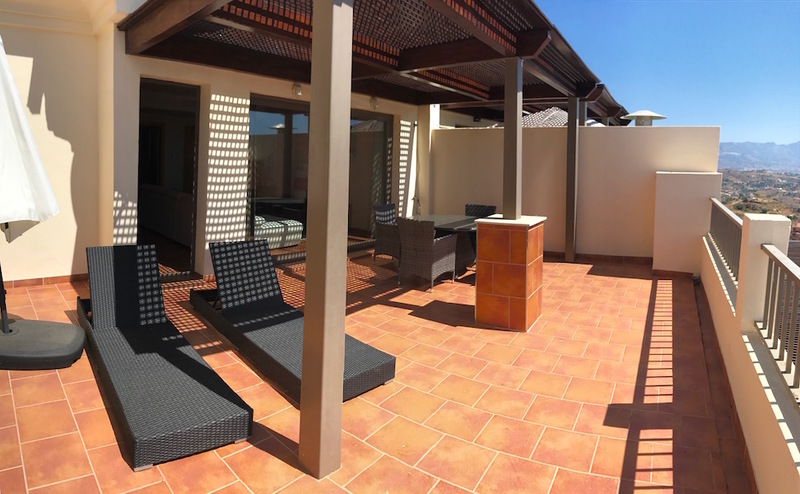 The pool and gardens are also adapted for disabled and wheelchair access. 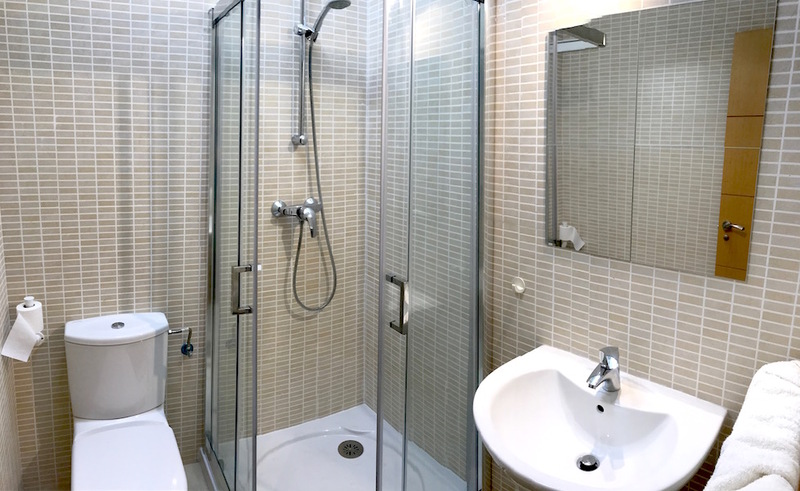 There is a bedroom with shower room on the lower level.